RePub, Erasmus University Repository: Does project management and network governance contribute to inter-organisational collaboration in primary care? 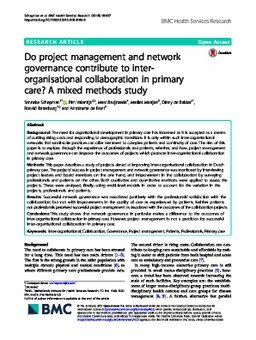 Does project management and network governance contribute to inter-organisational collaboration in primary care? Abstract Background: The need for organisational development in primary care has increased as it is accepted as a means of curbing rising costs and responding to demographic transitions. It is only within such inter-organisational networks that small-scale practices can offer treatment to complex patients and continuity of care. The aim of this paper is to explore, through the experience of professionals and patients, whether, and how, project management and network governance can improve the outcomes of projects which promote inter-organisational collaboration in primary care. Methods: This paper describes a study of projects aimed at improving inter-organisational collaboration in Dutch primary care. The projects' success in project management and network governance was monitored by interviewing project leaders and board members on the one hand, and improvement in the collaboration by surveying professionals and patients on the other. Both qualitative and quantitative methods were applied to assess the projects. These were analysed, finally, using multi-level models in order to account for the variation in the projects, professionals and patients. Results: Successful network governance was associated positively with the professionals’ satisfaction with the collaboration; but not with improvements in the quality of care as experienced by patients. Neither patients nor professionals perceived successful project management as associated with the outcomes of the collaboration projects. Conclusions: This study shows that network governance in particular makes a difference to the outcomes of inter-organisational collaboration in primary care. However, project management is not a predictor for successful inter-organisational collaboration in primary care.